That the works of the original Stoics survive still today is truly remarkable. That you can walk into a Barnes & Noble today, wander to the philosophy section, and grab a copy of Meditations by Marcus Aurelius, Discourses by Epictetus, or Letters from a Stoic by Seneca, and that hundreds and thousands of people have and still do, is a fact worthy of considerable bewilderment. And not because these works stand the test of some two millennia. But because the Author’s had no intention of publishing a book. Meditations is the private thoughts of a man trying to navigate ruling the Roman Empire. Discourses is the product of the copious note-taking of a student aware that his teacher’s words might be useful to those who could not attend lectures. And Letters from a Stoic is the responses of a man to a friend in need of advice. These works are not just timeless, they’re unlike any other work you’ll find on the shelves of bookstores. If you wanted to find criticism for these works, you might say the thoughts are scattered, the themes disorganized, or the “chapters” not arranged like most books. Well, they’re not written like most books because they weren’t written to be books! Ward Farnsworth is the Dean and Research Chair of The University of Texas School of Law. He served as a law clerk to Anthony M. Kennedy of the United States Supreme Court. He’s written books on law, rhetoric, and chess, as well as scholarly articles on the economic analysis of law, constitutional law, statutory interpretation, jurisprudence, and cognitive psychology. To say Ward Farnsworth has a taste for the organization and systemizing of information is accurate and may even be understated. Ward is a lifelong student of Stoicism. A daily practitioner guided by the works of the original Stoics, the teacher in Ward led to his mission of compiling, organizing, and giving sequence to the material of the Ancient Stoics in a way that isn’t the concern of an Emperor jotting down thoughts, a statesmen responding to letters, or a teacher answering the questions of his students. 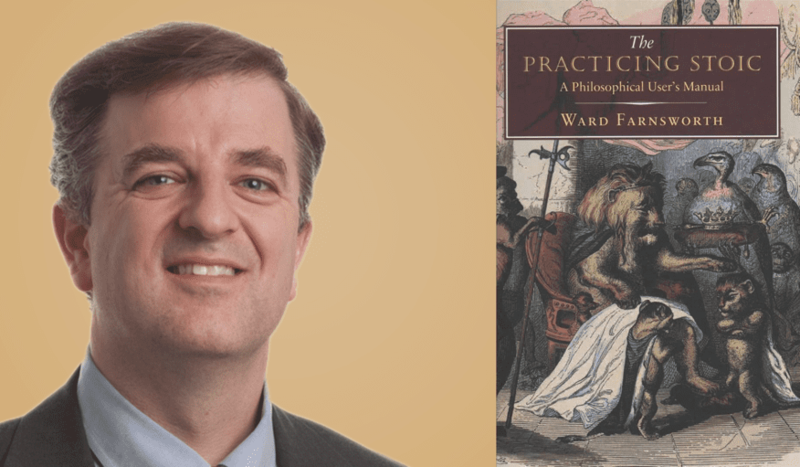 Ward’s presents that in his new book The Practicing Stoic: A Philosophical User’s Manual. You have a new book out, The Practicing Stoic: A Philosophical User’s Manual. Can you tell us more about why you wrote it? Well, there is a hole in the literature on Stoicism that I wanted to fill. Of all the philosophers of the classical world, the Stoics were the ones with the most to say to us now. But they weren’t systematic. They usually talk about things in no particular order, with lots or redundancies and without ever referring to each other. So you find lots of valuable ideas to think about, but the miscellaneous way they are presented makes it hard to see Stoicism whole or to learn it in a straightforward way. There are books in which modern authors try to explain Stoicism, but no books in which the original Stoics present it as a whole—because that is not how the original Stoics wrote about it. The Stoics—at least the ones whose writings have survived—weren’t trying to lay out the philosophy in the way we might now expect. Marcus Aurelius was writing journal entries, Seneca was writing letters to his friend, and Epictetus was saying whatever he felt like saying in class, or whatever Arrian saw fit to record. Of course Seneca also has some essays on particular topics, but those discussions wander a great deal. So how does your book fix this? The book puts the main ideas of the Stoics under twelve headings, or lessons. They’re in order, from the foundational points to the applications of them in various parts of life. Then the book shows what the original Stoic teachers said about each of those topics—about money, or fame, or hardship and so on. The book shows what they said, and the way they said it, all broken down in detail. Is the idea to compare what the different Stoics said on the same topics? Yes, the format lets them talk to each other. I’ve also refreshed the translations, and put in commentary to make it all easier to understand (I hope). Basically it’s what a course in Stoicism might sound like if the original Stoics were teaching it in a step-by-step way. Who’s the audience for the book? It’s for anyone getting interested in Stoicism who wants an introduction to the subject, and who wants to receive the teachings from their original sources. The book is also meant for people who already know the philosophy well. For them I intend it to have value as a reference. If you want to know what your favorite Stoic said about a question, the book lets you look it up easily. For any given point about death or emotion or adversity, you can see what Marcus Aurelius said about it, next to what Epictetus said about it, next to what Seneca said about it. It’s the book about Stoicism that I have long wanted but couldn’t find. You said the book presents Stoic ideas “in order.” How do you think about which points come first? The first principle of Stoicism—or at least of the version the book offers—is that we don’t react to things and events; we react to what we think about them. The next principle involves the Stoic attitude toward externals—namely, that you shouldn’t waste energy on things you can’t control. Why do you put those points first? They’re two sides of the same coin. Most people don’t realize how much of their experience is in fact a product of their own thinking and how much control they have over it. They also overestimate their control over externals. Stoics try to reverse that pattern, and to move their center of gravity to a more useful location. They encourage us to rethink our interpretations of events and take responsibility for them, and to let go of externals over which we have no control. The more specific Stoic teachings on desire, status, virtue, etc., follow from those first principles. Your book talks about different approaches to persuasion used by the Stoics. What do you have in mind? The famous Stoic teachers were rhetorically very talented. Sometimes they would take apart some mental state—fear or anger, for example—and lay it bare by analyzing its origins and showing it to be irrational. In other words, they make arguments. But sometimes their approach isn’t so much analytical as intuitive. By “intuitive,” I mean they convince by showing rather than explaining. The Stoics are masters of perspectives that bring the reader to the same place as arguments like those just mentioned, but without the arguments. Some good examples of those perspectives would be comparing problems or events to the scale of the world, or of time, or seeing them as they would look from far away, or seeing your own actions through the eyes of an onlooker, or regarding what happens to yourself as you would if it happened to someone else. Stoics get adept at viewing life from angles like these that encourage humility and virtue and dissolve some of the misjudgments we live by. And they mix those analytical and intuitive styles with much ingenuity, as the book shows. The book includes some ancient authors who don’t always appear in studies of Stoicism. Who did you include and why? The most important writers in the book are Seneca, Marcus Aurelius, and Epictetus, because they’re the Stoics whose work has survived and endured the best. But once an idea is identified as “Stoic” because it’s in their writings, I like to show how cousins of the Stoics also played with it. By cousins I mean ancient philosophers who weren’t Stoics themselves but held the same views on various practical points—mostly Cicero, Plutarch, and Epicurus. The last two especially have often been considered adversaries of the Stoicism. But they agreed with the Stoics on many of the questions that are now likely to interest us the most. You also give examples from some writers who weren’t ancient. What about them? Yes, the book also shows how its ideas have been used by the descendants of the Stoics. So the book has many illustrations from Montaigne, Johnson, and Schopenhauer. Anyone who studies Stoic ideas will want to see what those thinkers did with them. They weren’t quite Stoics themselves, but sometimes they explain Stoic ideas more elaborately and memorably than the Stoics did. Are there parts of Stoic philosophy the book doesn’t address? The book is just about the practical side of Stoicism—the problems of life that the Stoics talked about and that we all still deal with now. It treats Stoicism as a psychological practice, not as theology. So it doesn’t get into Stoic views about God or the intelligence of nature. The book takes the view that the Stoics still matter to us because their ideas about human nature were so powerful, not so much their vision of the cosmos. The Stoics produced many brilliant one-liners. Is there one that stands out to you most? One that has stayed with you? Or any Stoic quote in general? As I mentioned before, the book shows how some philosophers who weren’t Stoics have nevertheless expressed some of the Stoic teachings very usefully. One of them is Plutarch. He attacked the Greek Stoics on various theoretical grounds. But in his ethics he had a lot in common with Seneca and the rest of the Stoics who came later. Your book spends some time addressing misconceptions about Stoicism. Which do you think are the most important? Stoicism is easy to misunderstand, of course, because the word “Stoic” is used in such misleading ways today in English. Stoics are sometimes thought to be humorless, but actually a Stoic is more likely to be distinguished by mild humor in the face of things regarded as grim by others. And some people think Stoicism tells people to withdraw from the world. But Stoics find their satisfactions in helping others, and are supposed to get involved in public affairs however they can. The book shows the original Stoic views on all of these points. The book also talks about some deeper misunderstandings. The most important is that Stoicism is inconsistent with compassion for others. That’s not true, of course, as the original writings of the Stoics show. Late in the book I offer a way to think about this question. Stoicism tries to get its students to approach the troubles of other people like a good doctor would. Veteran doctors are very compassionate, and they give their all to their patients. But they don’t get emotional about it. They might have done so when they were first getting started, but experience tends to turn them into natural stoics in their professional lives. That’s one way to think about Stoicism: it’s an effort to gain, by the study of philosophy, some of the traits and immunities that would otherwise be the natural result of long experience. The study of stoicism is kind of a surrogate for the passage of time. You’re the dean of a law school. What overlaps did you find, if any, between the study of law and Stoic philosophy? Do you ask of your students who are aspiring for a career in law to study the Stoics? I suggest it to law students because I think there is overlap between the Stoic outlook and the professional mentality of a good lawyer, just as with the kind of doctor I mentioned a moment ago. Good lawyers are very committed to their clients and quite able to sympathize with them. But they’re also even-keeled emotionally, and when presented with a conflict they will view it from many perspectives, including some that are counterintuitive and that the client can’t easily see. That balance is something like what the Stoics seek in many departments of their lives. Speaking of overlaps between disciplines, you’ve once quipped that you have too many interests for your own good. Can you talk to us about all the fields you have studied and written about and how they help each other? We’d be particularly curious of course how Stoicism helps in other domains. I’m interested in effective thinking and writing, and in what we can learn about those arts from those who have had a talent for them. So I have a book called Classical English Rhetoric, which takes ideas about how to write first identified in Ancient Greece and Rome and shows how they can be used to great effect in English. The book on Stoicism is similar in format and spirit. I have another book on the use of metaphor, and a book on legal thought, and a couple of books on chess. They all have a family resemblance. They’re books about thought, about the recognition of patterns, about the use of the mind and the use of words.